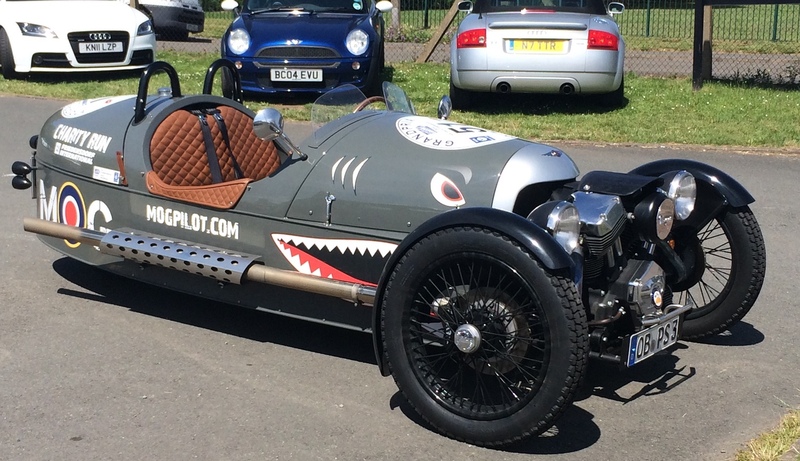 Morgan Motor Cars, worth a visit - Well Dressed Dad - It is a proper menswear blog. Like, with original words and opinions and suchlike. A while back I posted a couple of reports from this summers holiday in the UK. Basically we drove around the South and then drove some around the North, and in between we stopped here and there and looked at interesting things. 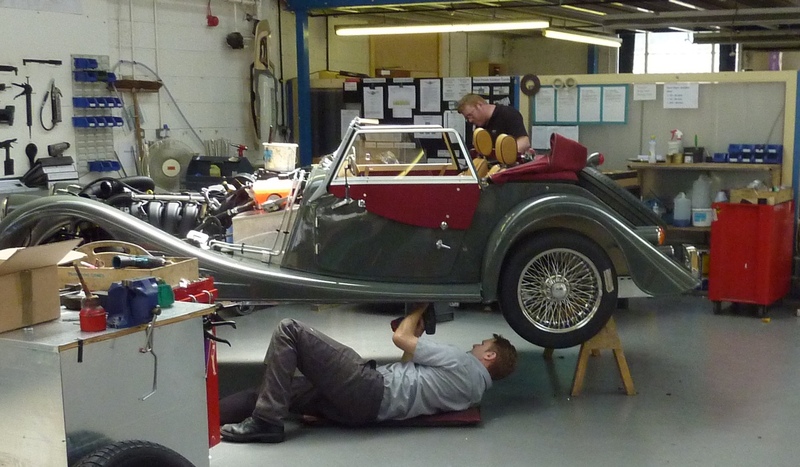 In part one of the road trip I mentioned that we’d stopped off to visit the Morgan Motor Car factory in Great Malvern, and that it was a good visit. I feel this might not have fully conveyed the depth of the awesomeness that we experienced there, so here is a fuller report, with lots of photos. Driving into the ancient spa-town of Malvern is like driving into any small British town. The roads, the houses and the shops are regular-issue British standard. The town itself though is steeped in history, both ancient and new, and in fact when reading the Wikipedia entry for Malvern I feel some regret for only visiting what I thought was the only attraction in town that day. Spotted in the carpark outside. 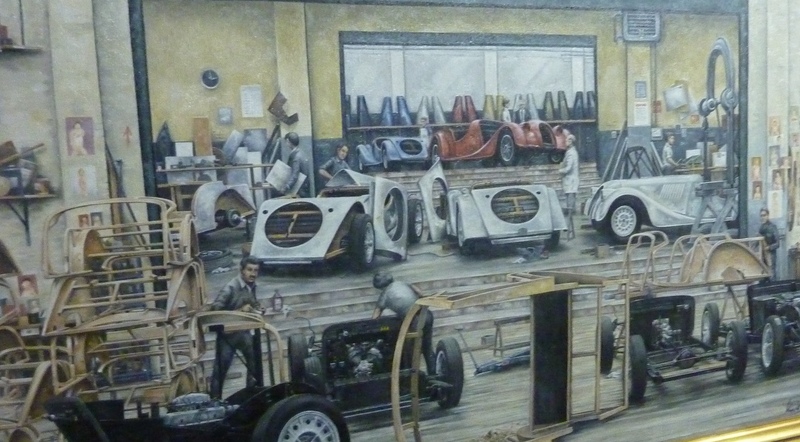 Finding the factory of Morgan Motor Cars was a little hit and miss, as the site itself is far from huge, and not very well signposted. We actually drove past it on our first try and had to turn back. Arriving at the factory gates though we found a car park for visitors, almost full even on this weekday in early summer. Judging by the registrations there were visitors from both the UK and abroad, and some had arrived in their own Morgans. 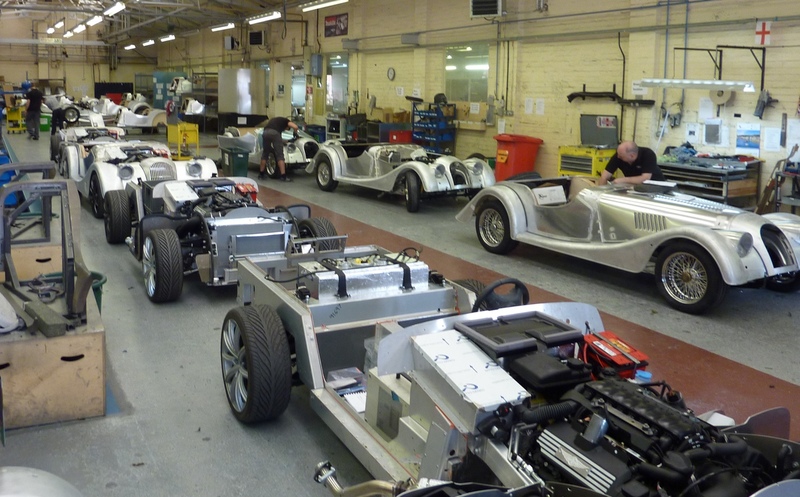 Clearly the factory is something of destination for the pilgrims, or loyal Morgan owners, of you like. We were initially informed that factory tours had to be booked up front, though upon showing such grievous disappointment they did allow us to join one of the planned tours. Honest, I did not throw a hissy fit or go into a sulk. I was very pleased that they were flexible. Probably best to pre-book if you fancy a visit yourself. From a painting in the museum section. The factory has changed not a bit since this was painted. We had to wait around a bit for our tour to start, so we had some lunch, browsed the shop and had a peek in the museum. Tours are obviously a bit thing at Morgan, as they have several retired factory chaps working as guides, and there were several groups hanging around. Our guide and an example of available finishes for the dashboard top. It was well worth the wait though. Even WDG who has no special interest in cars succumbed to the charm of the tour. Partly this was down to the guide doing a great job in showing and explaining, giving us both facts, odd tidbits and replying to questions underway. And if there is something Morgan has in spades it is quirky little stories. 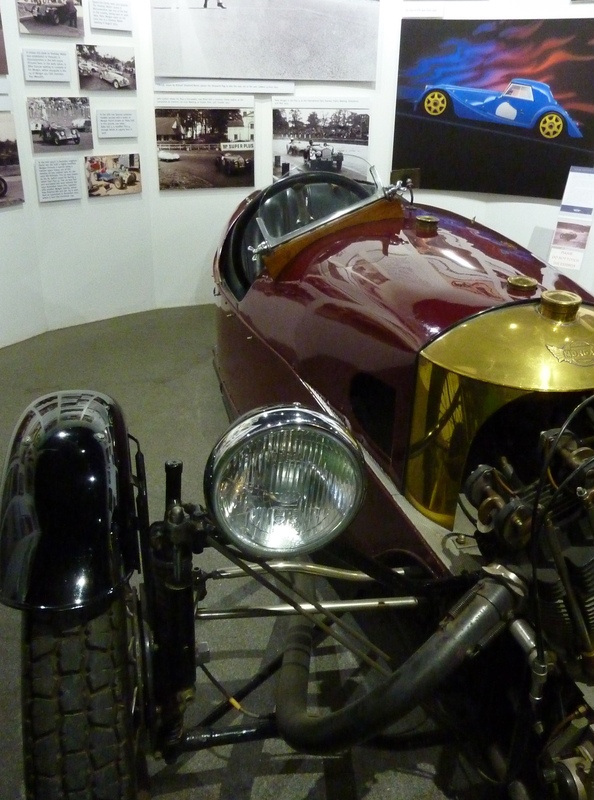 In essence Morgan produce four ranges of car today, if we discount the various engine sizes: The classic sportscar with a wood frame, the classic sportscar with a bonded aluminium chassis, the Aero supercar and the re-launched classic 3-wheeler. This means that there are three very different operations going on in the factory. A row of +8 roadsters under work. The classic sportscar starts in the wood shop, where all the necessary bits are cut out by hand. This means that they’re never 100% to spec, which makes life interesting for the guys that put all the bits together and cover them in the metal bodywork. All the little inaccuracies mean adjustments need to be made to ensure everything ends up looking right. Seeing a chap snipping away at the bonnet with metal shears to make it close properly was priceless. The modernised sportscar in the +8 and the Aero is made using much more high tech materials than wood, being made of bonded and formed aluminium. In fact, this is about as far from the original as you could get, yet the +8 Roadster looks just like one of the oldies. 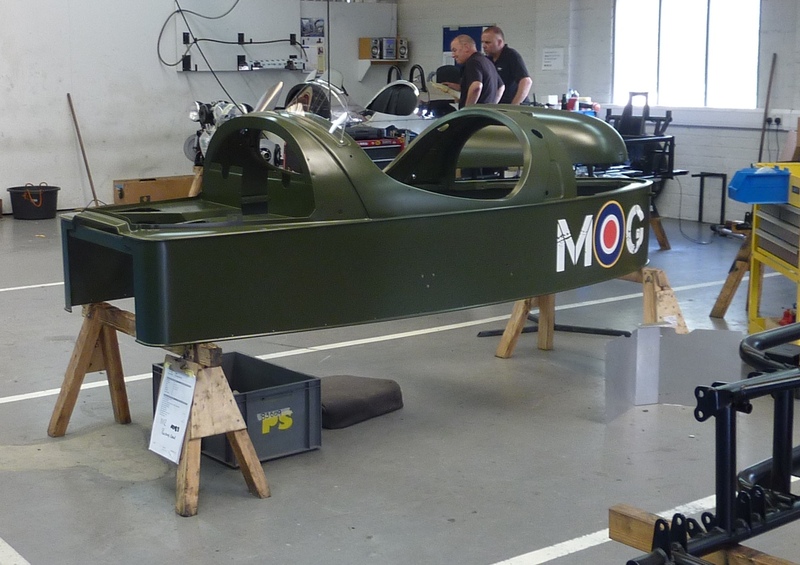 The Aero is a very modernised, and when introduced quite controversial, update of the traditional Morgan look. A three-wheeler in the production area. This is mostly only assembled from bits produced elsewhere. The recently re-introduced 3-wheeler is a return to Morgans roots. A small V-engine and two wheels up front, a tub for the driver and a passenger, and a single wheel at the back. The parts for the 3-wheeler are mostly made off-site and only assembly of the quite simple vehicle was done in the factory. Considering the simplicity and work involved I imagine the 3-wheeler is something of a cash-cow for Morgan. I still want one like crazy though, even if it is probably the silliest and least useful vehicle you can buy today. I’d like mine in the WW2 Spitfire look, thank you. The rear end of a classic model. The inner structure is all wood, covered in metal panels. Apart from making cars that look like they come from a bygone era, what really gets me about Morgan is how they appear quite happy to be what they are. They make what they make, at the tempo that works for them, in the factory they have. There are around people involved, making 170 or so cars a year, with a few months waiting list for those wanting to buy one. To my knowledge there is not a single poster on the premises proclaiming that unless they increase production they will die. There are no financial advisors wringing their tie demanding offshoring, outsourcing or any other whoring. Morgan appear to be just happy as they are, and it’s just perfect. Sneak photo of a worker “fettling” (aka the art of making things fit) the engine cover to the front wings. And the factory reflects this. It wouldn’t surprise me if it turned out that everyone involved were related in some way. It has that air of Santa’s workshop about it. The radio is on, theres a mug of tea at hand, people getting on with their stuff, but also available for a quick chat, either shouted across their work, or to answer questions from interested onlookers. Not that it is in any way a display of anachronistic and antiquated work practices, it’s a fully productive factory. You might get the impression that Morgan settled on how they did things a while back though, and unless someone has a bright idea, or there is some regulation that needs to be heeded, they’ll just keep on keeping on. Let’s be honest, there isn’t a rational reason to make half the car out of wood, but it does make for a heck of a talking point. 100 years! That covers almost the entire existence of horseless carriages. When we visited there was a banner outside celebrating their 100 years of producing cars in the same location. The fact that they’re still there, and not in some purpose built modern facility on some anonymous industrial estate says a lot about where their focus is. Bean-counters be damned! The factory race cars on display. Yes, they go racing! 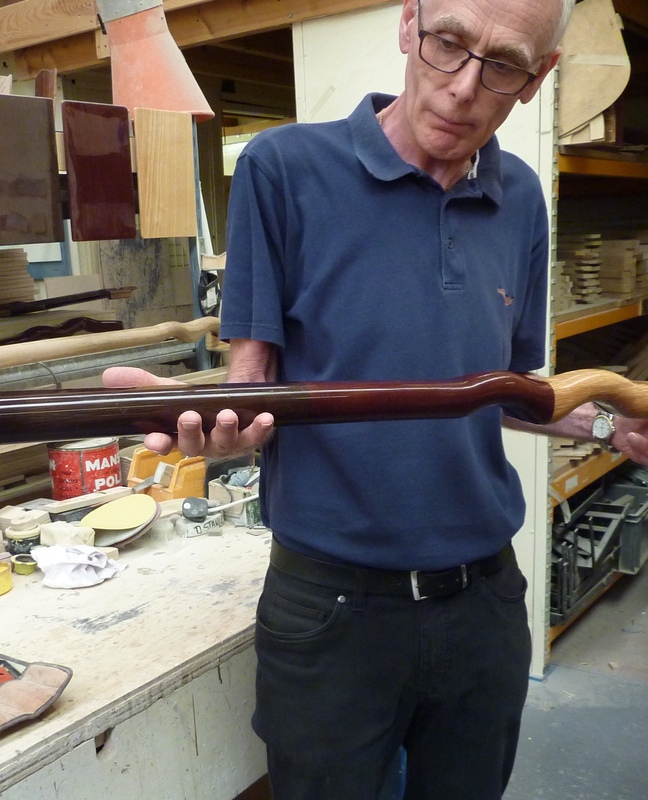 The best part of the tour is through the parts where they are making the classic model. The woodwork shop, the body shop, the trim and paint shops. This is how cars were built when humans still built them, using hand tools and craftsmen. The small scale of production allows for this today, though I’m not blind to the fact that if you were to make 1000x more cars it would make sense to use more machines. The level of fettling involved to make all the parts fit together to gain an acceptable end result is testimony to this. Assembling the hand-cut wood pieces and then attaching the stamped metal parts is a challenge when you’re not working to todays super-fine tolerances. Then again, you have dedicated and keen craftsmen with years and years of experience, so it does kind of work anyhow. I’ll take this one home with me, thankyouverymuch! 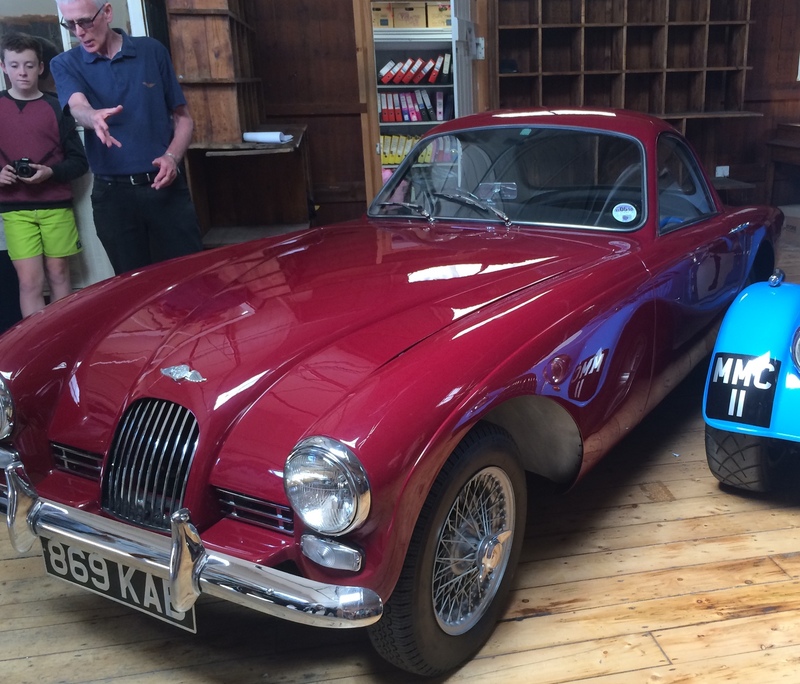 The tour was very effective in convincing me about the need to own a Morgan. 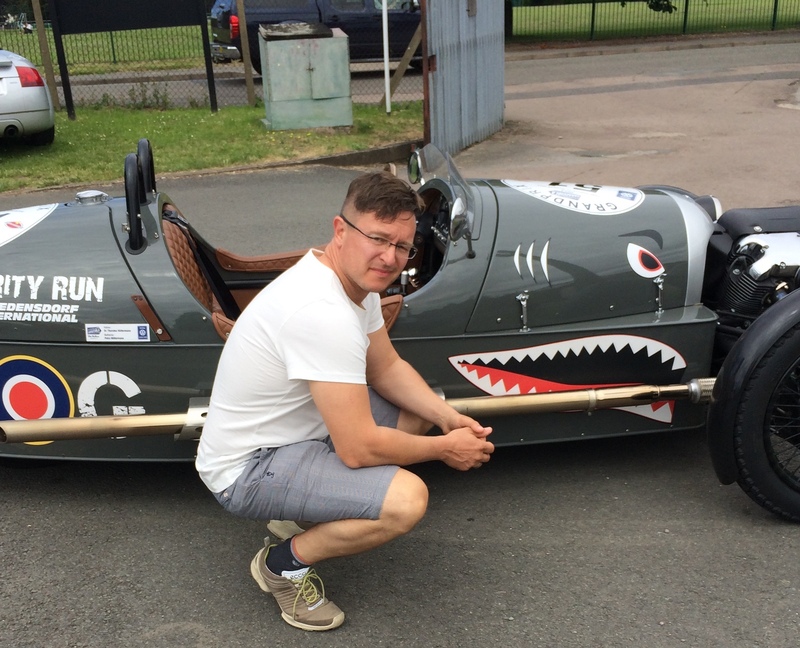 Like all the best of traditional Britishness, be it real ale, tweed or costume dramas, an open two-seater sportscar is essential. And being able to buy into the Morgan family is strangely compelling. One of the rare Morgans that doesn’t “look like a Morgan”. Great post and blog! I did the Morgan factory tour early this year and had a great time. 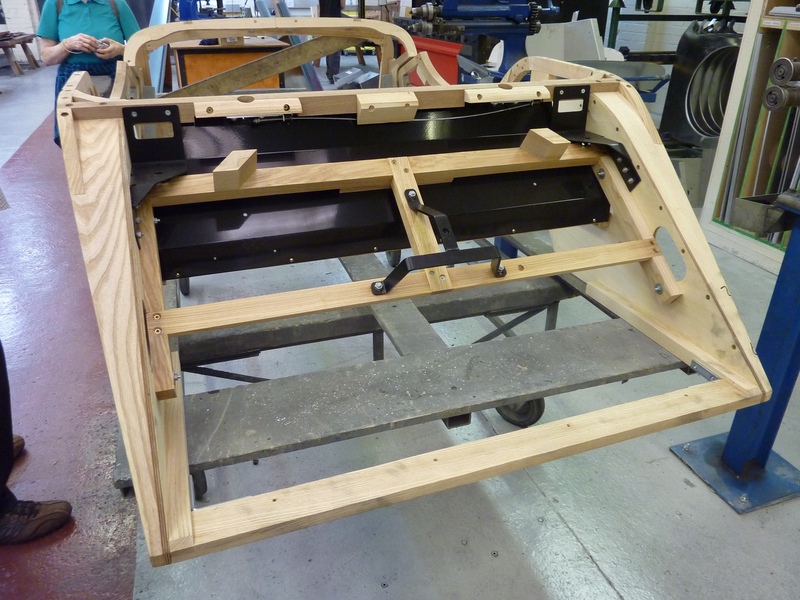 For your readers, the frames on the more traditional cars are made of wood but none of the chassis are.